Life in — or a visit to — Los Angeles, in my opinion, must include a drive down to San Diego. On this bight May day, I was so happy to be doing so. I had business to deal with and the bonus was the always vista-filled drive along the coast. I’d be dining on my own. No worries. As a solo traveler I’m quite comfortable sitting down to a meal by myself (as long as it’s a casual restaurant/eatery and not some white-linen place). Where can I get a good meal at a good price? On the corner of South Coast Highway and West E Street. Angelo’s Burgers entrance shot from E Street. 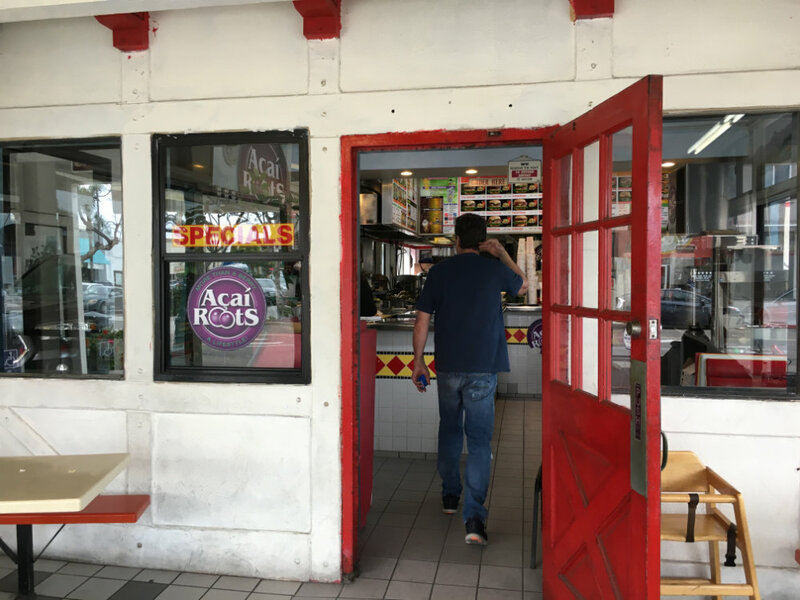 From the moment I approached Angelo’s Burgers, I was in love with it. Once a corner gas station, it is now a dual drive-in with two dine-in areas. It even has free parking. I arrived just ahead of the lunch hour. A man behind the counter was at the drive-up window helping a customer. Happily, this gave me time to read the seemingly myriad menus directly above me, to my left and to my right. Wow, there was a lot. 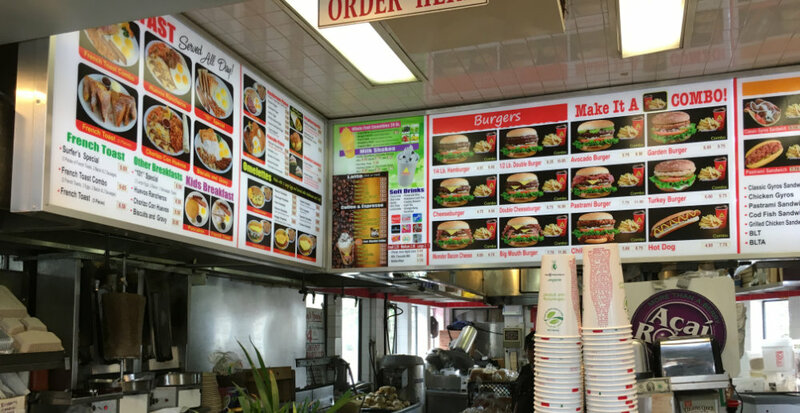 I thought I’d just be getting a burger and now I had so many options to choose from. Soon, the man bid a cheery see-you-next-time to his clearly-a-repeat-customer and turned to me, eyes smiling. Stathi greeted me and asked what I’d like. Smiling and sort of laughing as I replied, I said that it was my first time here, so I didn’t even know where to begin. Lucky for me, Stathi loves taking an active role in the family business and truly enjoys his customers! He took the time to find out what I was interested in and make recommendations for me. 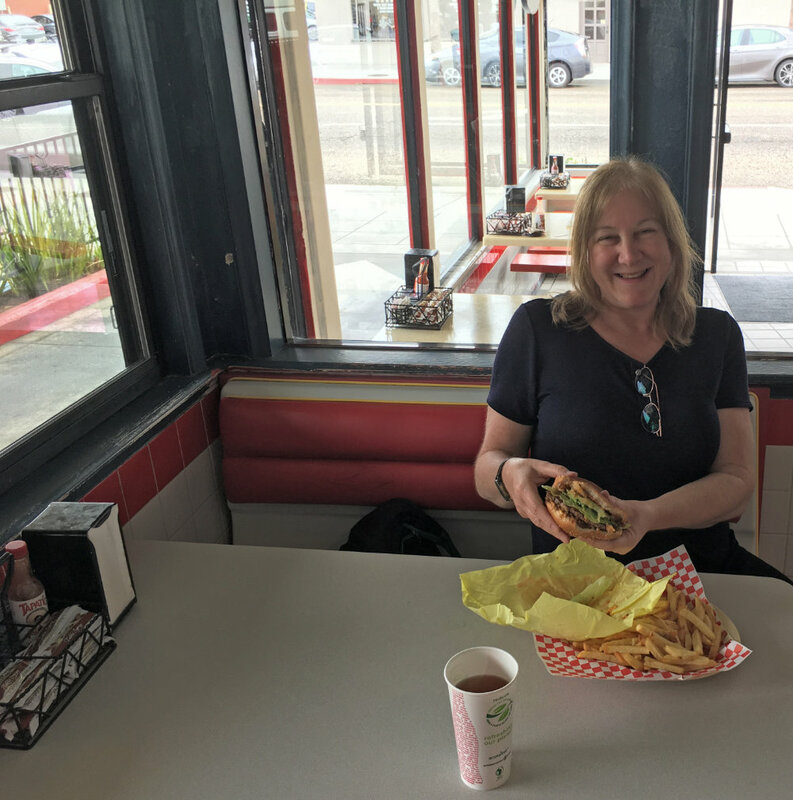 Stathi told me the Chili in the Chili Burger is homemade — and offered me a taste! That taste cinched it for me. Meanwhile, he mentioned that the fries are also freshly made. I’m not a combo type, in part because I don’t drink soda. When I mentioned this to Stathi, he replied that t I could have freshly home-brewed iced tea in lieu of soda. Soon I was seated and enjoying a Chili Burger with fabulous crisp freshly made fries and fresh iced tea. I loved my Chili burger. The fries were perfect – crisp, crunchy, hot. The iced tea was really nice, and as it’s not pre-sweetened, I got to fix it to my exact liking. Inside with the counter, cooks and cashier. I chose to sit where the action is, by the counter, cooks and cashier. As I slowly savored my big messy but manageable Chili Burger, I enjoyed watching Stathi and the kitchen staff in action. Each customer was greeted with a friendly hello and conversation, whether to help them decide or just taking our order or having a friendly chat (time permitting) with someone known. It was very clear that Stathi loves being here and running this business. Soon couple of men walked in and greeted Stathi. “It’s Friday, fish taco day!” the man said. And for him it is. That’s his tradition. The next group walked in and I heard breakfast burritos been ordered. I’d invited Stathi to come over and tell me more about the place if he had time. I was so happy that he did. Angelo’s was, for me, one of those special travel treats and I knew I wanted to share it with others. It was during these short intervals that I learned it had been a gas station. Funny that I hadn’t noticed. It took stepping back to take photos later to see that the cooking/ordering area would have been an office between pumps. At one point I commented that I’m surprised there aren’t Shakes here. That’s when I learned that there are. (It’s one thing to resist a fast-food Milk Shake but this is another story.) So I can also tell you from experience that the shakes are absolutely fabulous. This is a real shake. There are flecks of chocolate in my chocolate shake and you can see the ice cream in it as well. 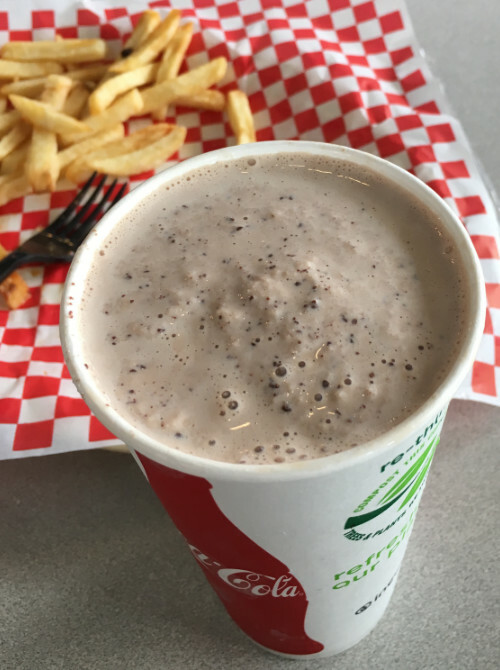 After cups of fresh iced tea to compliment my meal, this beautiful Chocolate Milk Shake was a nice dessert — and accompaniment as I continued my drive along the SouthernCalifornia coast. I found Angelo’s to be a very comfortable place to be. The menu is extensive and the prices very reasonable, especially taking it’s location into consideration. It’s just a few short blocks from the water. 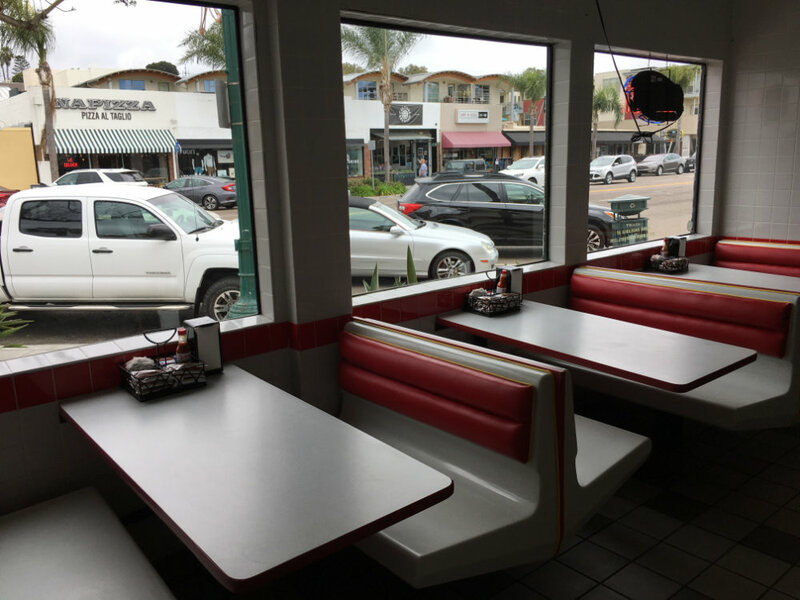 There may not be another value like this for miles north and south — unless it’s one of Angelo’s Burgers other two locations along this part of the Pacific Coast. 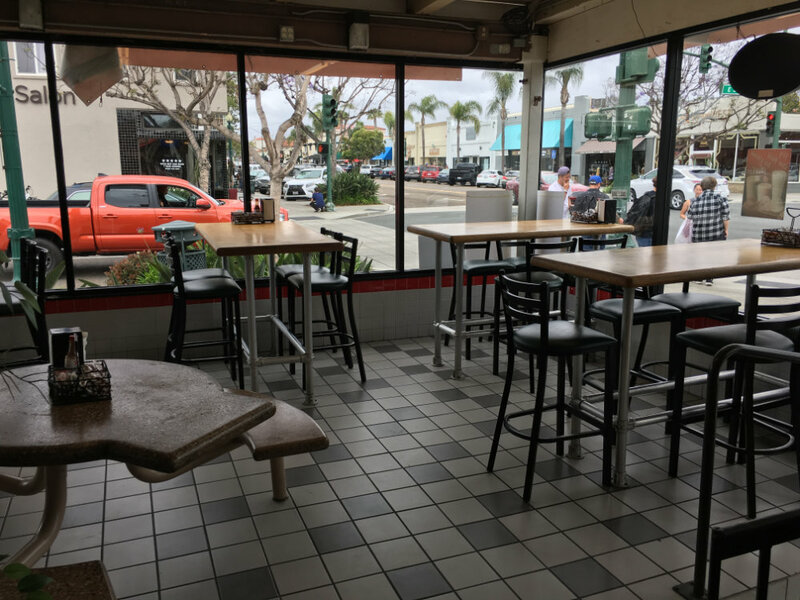 I was very much looking forward to having breakfast and a few other meals there as I returned to Carlsbad and went between my friend’s homes for the next month or so. Stathi said their Breakfast Burrito is their most popular item. Would my next meal there be the famous Breakfast Burrito — or the enticing French Toast, I pondered. Maybe a Gyro, an old favorite of mine. And then there’s the matter of when to have a Fish Taco…. Unfortunately, the four times I drove up and down the coast, it was at ridiculous hours that Angelo’s couldn’t be open. So as my travels continue, I’ll remember my go-to place on the San Diego coast. 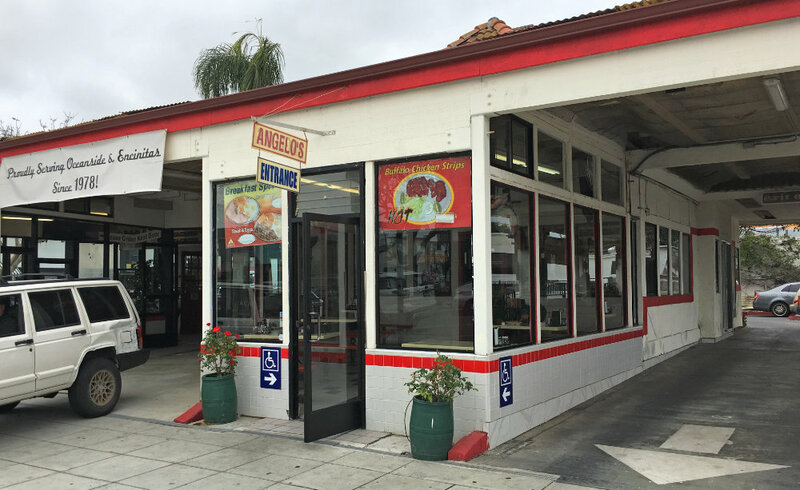 Angelo’s Burgers — a family-owned business that the family loves and cares about. A family-owned business that cares about its customers. Maybe you’ll get to stop in for some great fries and say hello to Stathi if you travel to the area. Say hi for me, too! That’s the corner of South Coast Highway and West E Street. Free parking in its own parking lot. Parking in the neighborhood if the lot is full. I haven’t gotten there yet though. There’s one more, too, someone along the coast.